It was cold when we woke up at Cold Creek, but we could see the sun would soon be upon us. We knew we had a hard morning of climbing ahead of us before the long downhill. At once the road got a lot rougher than it had been the day before. There were some places where slides had fallen over the road and the rubble just bulldozed aside, leaving a lot of rock to navigate. Then there was a lot of loose gravel on some of the steep climbs which made it had to keep traction. Then there was a long section of decent road and a manageable grade when I got into my stride and felt like I was really making progress. 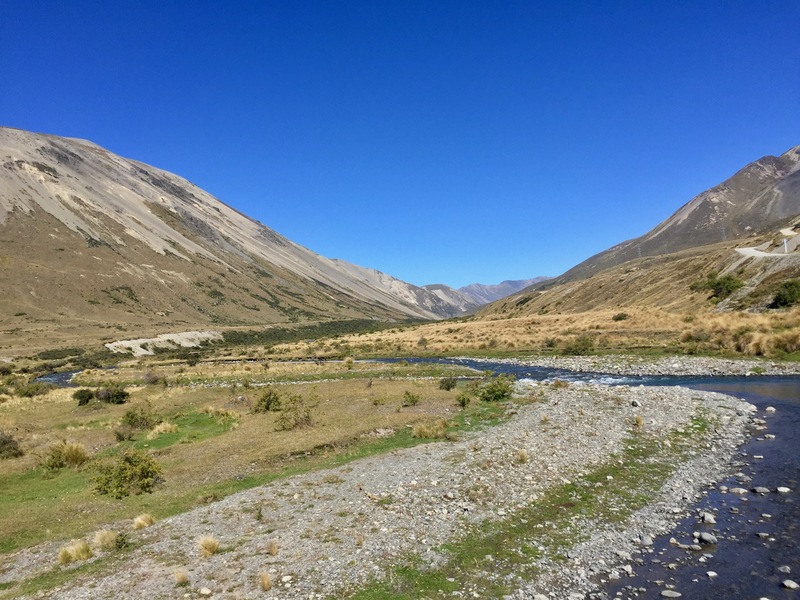 Of course we were still following the Wairau River so after every bit of climbing the road would dive back down to the valley bottom. 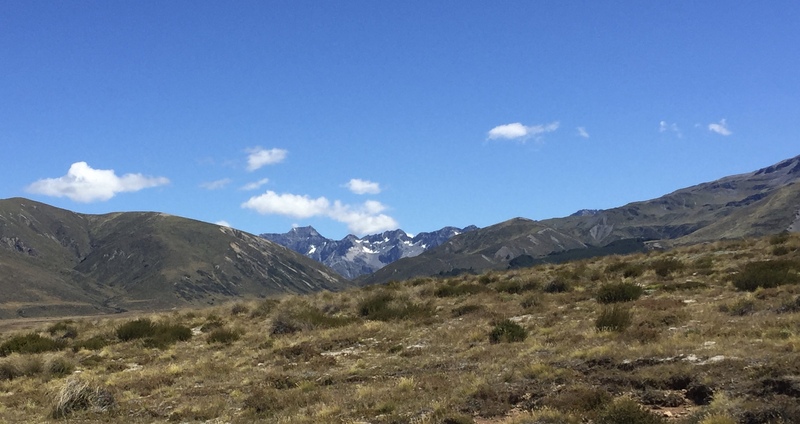 We then came to the boundary between the Rainbow Station and the Molesworth Station. These are the two huge cattle stations that the trail crosses. 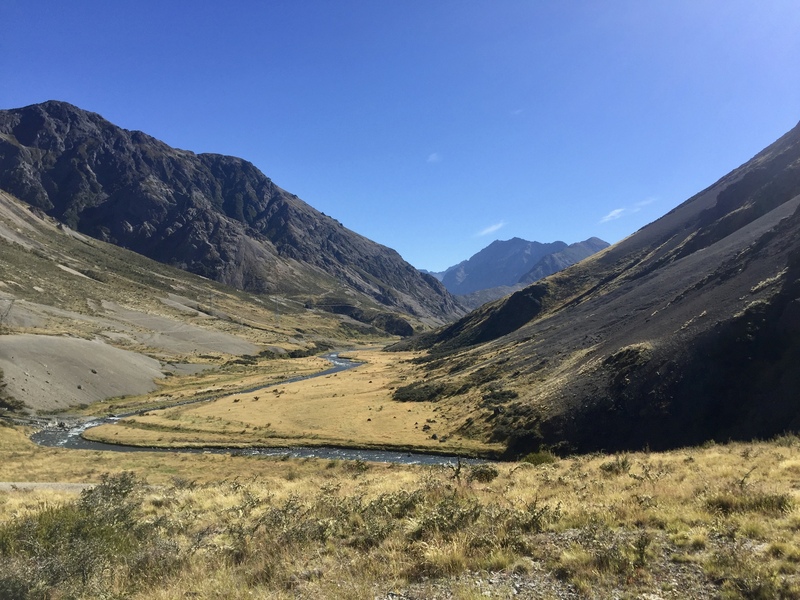 At this point we were still in the Upper Wairau Valley, and still climbing. We new there would be 200 meters in 2 km at the top. Metric makes it really easy to determine that would be a 10% grade. Soon enough we came to it and I started pushing/pulling my bike along. A few times it looked ridable and I tried to get on but could not get traction. Starting on a steep grade is hard. Finally I made it back on and was able to ride the final stretch to the top, where Jelle had already been waiting for some time. From Island Saddle we could actually see some lingering snow in the far off mountains. We were now at 1,347 m (4,419 ft), not as high as our Cascade passes but plenty high none the less, and it was some effort to get up here. In fact it may have been the hardest thing I've ever done. From here we had views back down the Wairau Valley, and ahead to the Clarence River Valley which we would be descending. The first couple of kilometers of the downhill was very steep, and the road was now badly corrugated (washboard) so we had to keep our speed way down until it leveled out. After that it was a good, wide gravel road, but still quite corrugated so it was a pretty jarring ride. We got to the turnoff for Tennyson Lake but we both felt more like pressing on then camping again at high altitude. We stopped at the turnoff for lunch, but did not ride the 1.5k in to see the lake. Instead we continued on until the old Saint James homestead where we again rested and ate. It was now getting hot and we were happy to find some shade. The rode continued steady and corrugated. We did not have to ford any creeks on this side as they all had bridges and the road was better maintained. There was some scenic stuff in this section that I did not get any pictures of. Eventually we got to the junction at Jacks Pass and had to start climbing again. Another 2k climb, and now there was traffic as well as loose gravel. After that 6 k fast downhill to Hanmer Springs. The river formed a wide plateau towards the top. 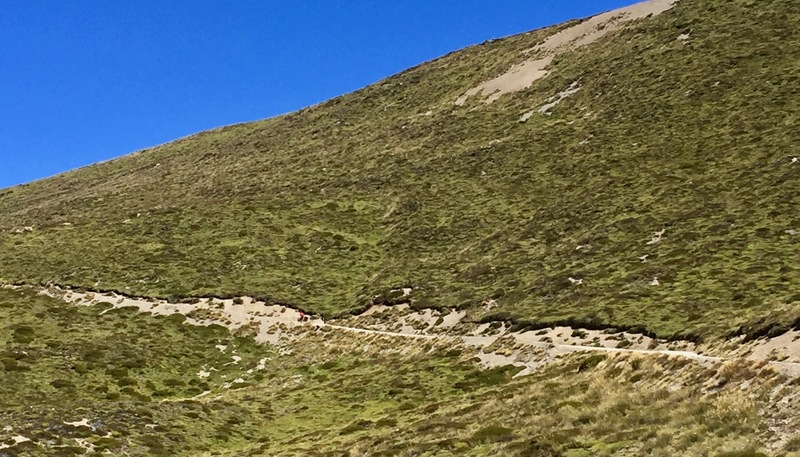 Can you see Jelle on the last big climb? Jelle got this classic shot of me on the descent into the Clarence River Valley. Another of Jelle's shots of me on the last gravel section. Looking down towards Hanmer Springs.